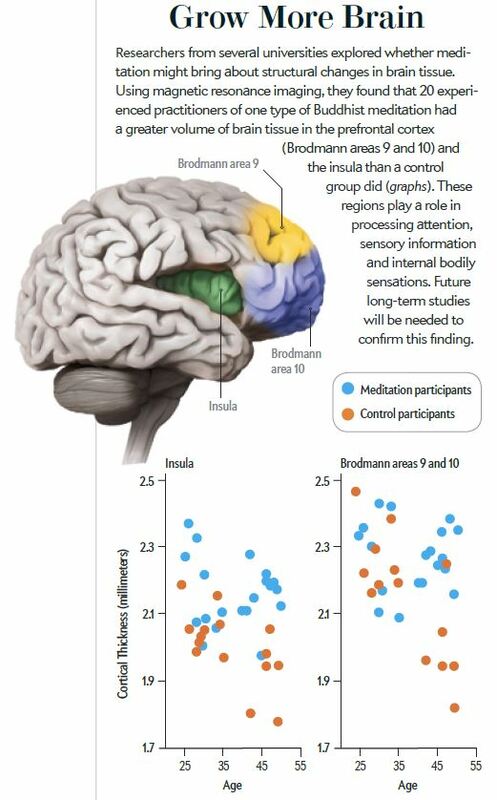 Scientific American Just put out a decent summary of the current neuroscience research on meditation written by friends, Matthieu Ricard, Antoine Lutz, and Richie Davidson. I enjoyed reading the article and thought I’d share it here with some commentary. 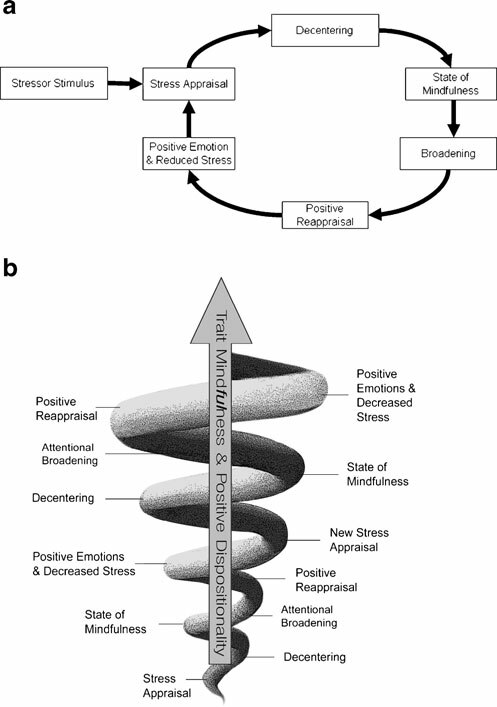 The article uses the same distinctions in meditation practice we outlined in our S-ART paper – That is Focused Attention, Open Monitoring (or Mindfulness), and Loving Kindness or Compassion (or ethical enhancement practices). 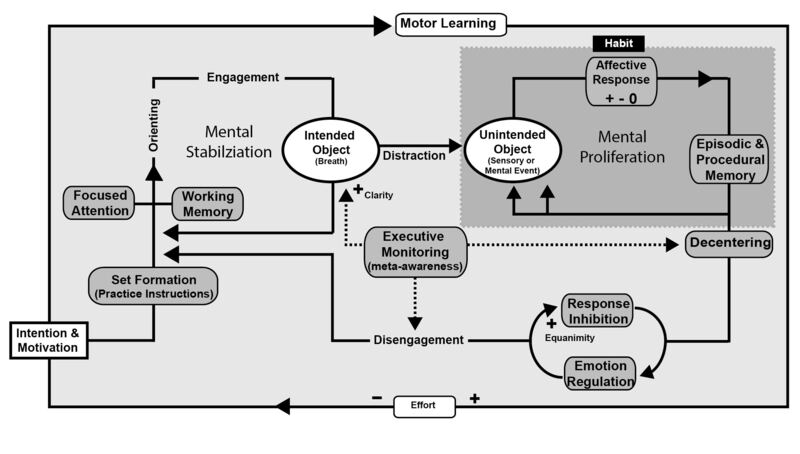 Essentially, they describe the act of meditating during Focused Attention similarly to the model below – A practitioner starts with the intention, orients attention and engages on object (Breath) – the mind becomes distracted and enters the mind-wandering default mode network – it realizes there is distraction (through decentering) and activates a salience network. 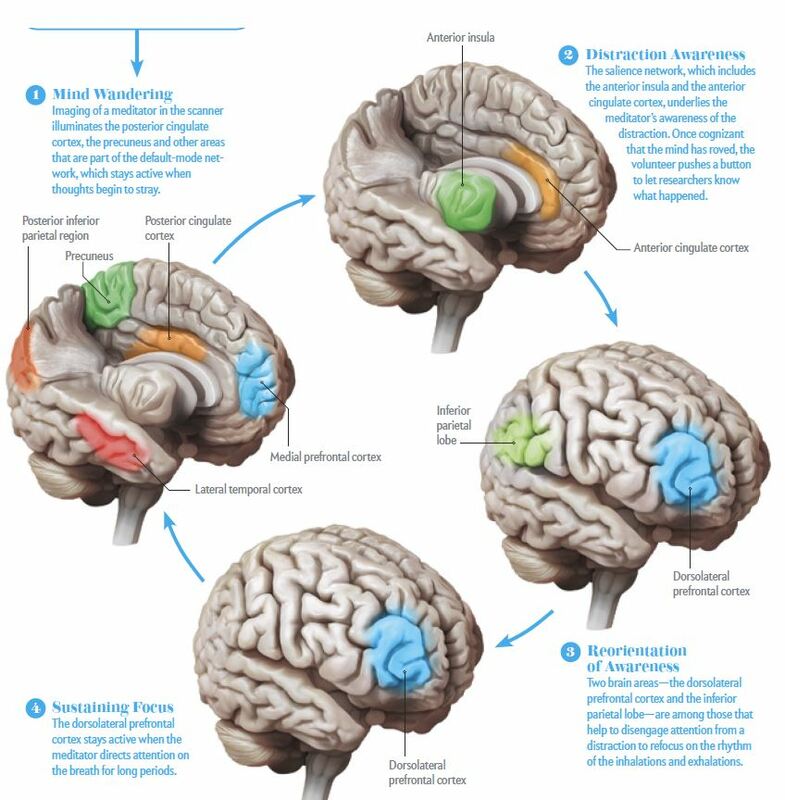 Reorientation of awarenesss than involves dorsolateral prefrontal cortex and anterior inferior parietal lobe. I would further argue that the larger frontoparietal control network (including nodes of the salience network and lateral frontopolar cortex and even the lateral cerebellum) all contribute to the decentering, monitoring, and reorientation process. the ventrolateral prefrontal cortex concurrently helps with response inhibition. Interestingly, the article also points out some of the morphological changes noted in a recent meta-analyses done by Kiran Fox HERE. 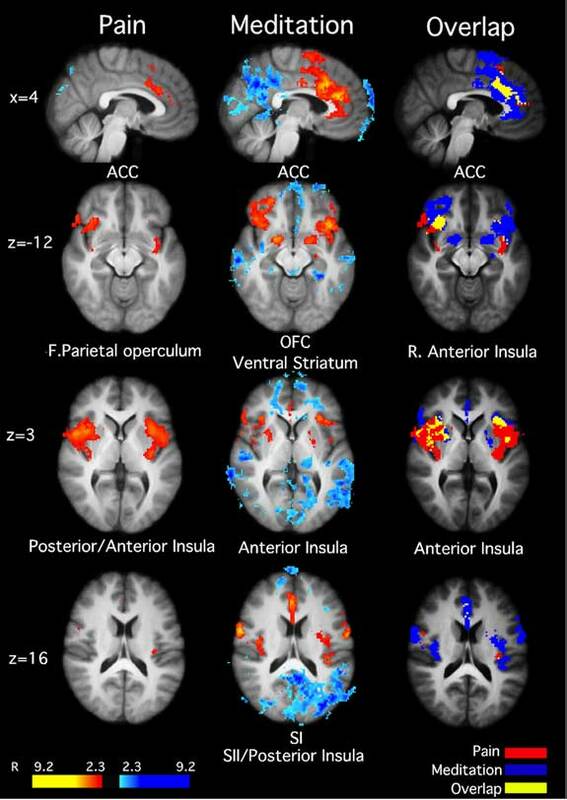 The study found the frontopolar cortex and anterior insula were 2 brain regions with neuroplastic changes most often found in such studies of meditators. Can meditation practice eliminate pain? NO, but it can it reduce the emotional intensity in which it is anticipated and experienced! However, there are other reports that suggest meditators are not suppressing the sensory or affective experience of pain, but rather increasing their sensory and affective experience of pain, but without a prolonged, dull, or negative quality. In this case, research is beginning to reveal what may be more akin to equanimity and embodiment, two qualities that typically are cultivated along with mindfulness during specific meditative practices. Equanimity refers to the ability to experience the sensory event fully, with awareness, but to return back to some normative baseline rapidly once the sensory event is over. There is no ruminative quality, or perseveration of the emotion in response to the sensory event. Embodiment refers to the whole-body visceral experience of the sensory event. These studies have been showing increased activation in brain areas responsible for primary and associative sensory processing along with interoception (internal bodily experience). Focused Attention meditation reduced BOLD activity related to afferent processing of pain stimulus (primary sensory cortex). Meditation was also associated with deactivations in areas related to ruminative types of thinking (Default areas). Decreased pain intensity ratings were also found to be associated with increased activity in ACC and right anterior insula, suggesting a site for pain modulation.